enthusiasm. 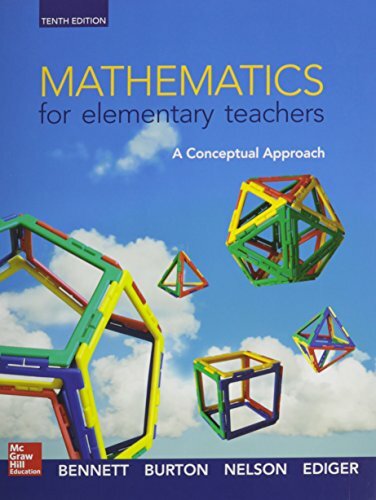 The text draws heavily on Common Core Standards and contains many pedagogical elements designed to foster reasoning, problem-solving and communication skills.Additionally, this text can be packaged with an activity set that corresponds to each section of the companion text, Mathematics for Elementary Teachers: An Activity Approach, also by the Bennett, Burton, and Nelson team. Mathematics for Elementary Teachers: An Activity Approach can be used independently or along with its companion, Mathematics for Elementary Teachers: A Conceptual Approach.McGraw-Hill Connect is a digital teaching and learning environment that saves students and instructors time while improving performance over a variety of critical outcomes. Connect strengthens the link between faculty, students and coursework, helping everyone accomplish more in less time. Innovative technology engages students in the course content so they are better prepared, are more active in discussion, and achieve better results.Connect is the only integrated learning system that empowers students by continuously adapting to deliver precisely what they need, when they need it, how they need it, so that your class time is more engaging and effective.